Practicing a programming language and developing a domain completes the new education for pursuing the most advanced life-style into internet age. Sangkrit literally means an “all-inclusive-execution” so teaches an inclusive way of education and vocation into hacktivism. Hacktivism holds a future for humanity in a direct democracy of digital dictatorship. Programming teaches inclusive way of thinking and developing a domain is like letting your private property becoming useful to others as well. So practicing a programming language and developing a domain completes the new education for pursuing the most advanced life style into internet age. That builds the core of Sangkrit. Besides everyone can become a personal outlet of a globally distributed order of liberating humankind into internet age i.e. 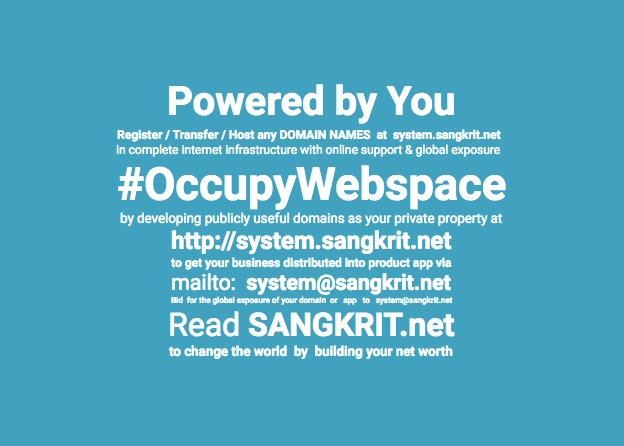 SANGKRIT.net practicing hacktivism and building its vanguard. Hacktivism helps everyone in developing their own individual domains with complete internet infrastructure, online support and global exposure. Hacktivism encourages everyone build own net worth by upgrading public life standards to change the world. Hacktivism makes people learn living in social privacy with public cooperation by freeing the software and opening the government. Hacktivism makes your home a complete ecosystem of all that. Thus Sangkrit systematically liberates humankind into internet age by establishing another way of life as hacktivism.